“No Matter What” is currently a Top 10 song and climbing across all audience/airplay and AC radio charts at Billboard and Mediabase. It is also featured on Spotify’s Top Christian and Top Christian Contemporary playlists and AppleMusic’s A-List: Christian. 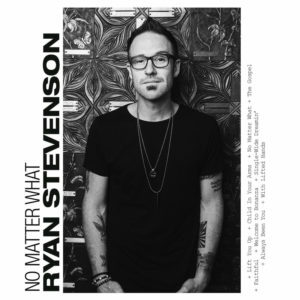 Continuing his radio success as a solid staple for the Christian radio listener, Stevenson currently has two songs in the Top 50 Audience/Airplay charts. Releasing in April, No Matter What offers soul-stirring tracks such as the 2017 hit song “The Gospel,” and “Faithful” featuring Amy Grant, who also co-wrote the song with Stevenson and the album’s producer, Bryan Fowler. Since the release of the album, he has been sharing his story with media outlets throughout this summer including podcasts such as the Jesus Calling Podcast, Life of Dad podcast and Andrew Osenga’s The Pivot podcast. He has also been featured on CCM Magazine’s Features in Film with Andrew Greer, and wrote a month long devotional series with CBN’s PRAISE.com (click here for one of the devotionals). After a summer of festivals and tour dates, it was announced last week that Stevenson will be joining TobyMac on his tour this November. Tickets for the “TobyMac and DiverseCity: The Theatre Tour” will go on sale this Friday, July 27th. Dates are listed below. ABOUT RYAN STEVENSON: Following a nine-year stint as a paramedic, Pacific Northwest native Ryan Stevenson signed an exclusive agreement with Gotee Records in 2013 after capturing TobyMac’s attention by co-writing the No. 1 and Grammy® nominated single “Speak Life,” His first recording for the label was the Holding Nothing Back EP in 2013, which garnered the Top 25 single “Holding Nothing Back.” This was followed by 2015’s full-length album Fresh Start, which featured the No. 1 radio single “Eye of the Storm.” With three No. 1 singles (two as an artist and one as a co-writer), a GRAMMY® nomination, Billboard Music Award nomination, a Dove Award (2017), ASCAP honors and major tour bills with the likes of TobyMac, MercyMe, Newsboys and Matt Maher, among others, Ryan has already distinguished himself as a rare talent whose unique perspective guides his honest lyrics and sonic sensibilities. This entry was posted in Christian Contemporary, Music Videos, Reviews and tagged No Matter What, Ryan Stevenson by Kris Patrick. Bookmark the permalink.